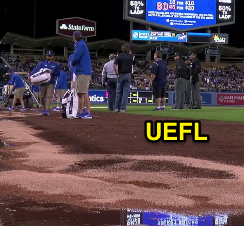 Tuesday's Spring Training finale at Dodger Stadium came to an abrupt halt in the bottom of the 5th inning, when a third-base side water main burst and flooded the left field warning track, purportedly with sewage, along foul territory. Enter the unconventional plumbing delay. Pipe bursts, making the field unfit for play. After further delay and consultation with the grounds crew and both clubs, Crew Chief Gerry Davis opted to call the game pursuant to Official Baseball Rule 7.01 and 4.08(g). First, OBR 4.08(g) states that, "Between games of a doubleheader, or whenever a game is suspended because of the unfitness of the playing field, the umpire-in-chief shall have control of ground-keepers and assistants for the purpose of making the playing field fit for play. PENALTY: For violation, the umpire-in-chief may forfeit the game to the visiting team." Because the home team was leading at the time Davis called the game after the visiting team had already batted five times (e.g., the bottom of the 5th inning), it became a regulation game (Rule 7.01[c]) that, had this occurred during the regular season, may well have become a suspended game to be completed at a future date (Rule 7.02[a]); because of the Spring Training nature of the game, naturally, the game became final with the home team the victor. It was Rule 7.02(a)(3) (then known as Rule 4.12(a)) that served as basis for a Giants protest in August 2014, resulting in MLB's first upheld protest in nearly three decades and an order to continue the suspended game. Related Post: Forgoing "Time" to Power Through Light Failure (4/14/17). As we recently reviewed, the home team determines whether or not to start the game, but, once started, the umpire has sole authority to call or suspend the game, in accordance with the official rules. Related Post: Ask the UEFL - Testing for Fog and Other Perils of Play (3/17/18). For what it's worth, the third and final Replay Review of the 2018 preseason was also the third call to go against the Dodgers following a manager's challenge. 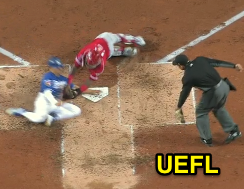 In the 2nd, Angels center fielder Mike Trout's relay to shortstop Andrelton Simmons to catcher Martin Maldonado was just in time to nab Dodgers baserunner Enrique Hernandez trying to score from first base. HP Umpire John Libka's out call stood following a challenge by Dodgers Manager Dave Roberts.